Provide comfort for the family of Virginia Homan with a meaningful gesture of sympathy. 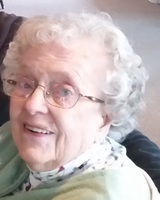 AVON - CORNING - Passed into heaven on March 28, 2019 in her one hundredth year. She was born on November 2, 1919 to Arthur Claude and Lulu Eloise Black of Painted Post, New York. She was predeceased by her loving husband of 45 years, Robert L. Homan, brother, Arthur Claude Black (Lorrain), and infant grandson, Nathan Thomas Homan. She is survived by son, Dr. Brian S. Homan (Kathleen) and daughter, Cynthia L. Towler (William), three grandchildren, Andrew Towler (Michelle), Bethany Murphy (Daniel), and Josiah Homan (Megan). Virginia was blessed with five great grandchildren. Virginia was a music educator in the Corning-Painted Post City School District, and was a noted singer, appearing with the Corning Philharmonic Orchestra and the Corning First United Methodist Church. She received her degree in music education from Houghton College and completed further course work at Ithaca and Elmira Colleges. Virginia was a member of PEO Sorority, Delta Kappa Gamma, the Tyrone Eastern Stars, and the Corning Area Retired Teachers. Virginia continued to teach piano in her retirement and conducted the choir at the Tyrone United Methodist Church. She lived with Brian in North Syracuse after leaving Tyrone and moved to the Rochester area in 2015 to be close to Cynthia. She enjoyed her friends at the Legacy in Henrietta and her helper and friend, Sandi Reandeau. A celebration of Virginia’s life will be held on Sunday, April 28 at 2:00 PM at the Tyrone United Methodist Church, 3647 Church Hill Road, Tyrone, NY 14887. In Lieu of flowers, donations may be made to the Geneseo Parish Outreach Center, in care of the Geneseo United Methodist Church, 4520 Genesee Street, Geneseo, NY 14454. We encourage you to share your most beloved memories of Virginia here, so that the family and other loved ones can always see it. You can upload cherished photographs, or share your favorite stories, and can even comment on those shared by others.